Come and join the other; cold hearts for the winter time of your life. 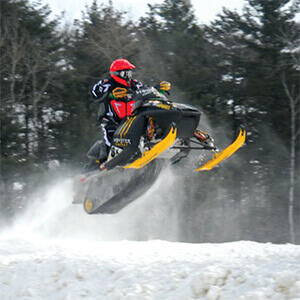 There's plenty of snow to go around, whether you want to go snowmobiling, tubing, or cross country skiing. Clearfield County has many great places for the cold-blooded sportsman to sink a line. 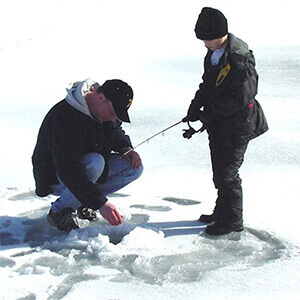 Recommended are Parker Dam, Curwensville Lake Recreation Area, Treasure Lake and Janesville Dam. Cabins are available at Parker Dam and there are plenty of hotels with warm comfortable rooms, so why not take a winter vacation, settle in on your bucket seat, and see what bites? Geocaching in the winter is a great way to experience the outdoors, see wildlife in a different way, and learn something as well. Parker Dam State Park holds geocaching classes, activities and searches. Hone your newly acquired skills on the S.B. Elliott Civilian Conservation Corps historic geocache or test your skill level on one of the many Backwoods, Backroads, Backwaters caches. For more information log on to http://www.geocaching.com. There are 4 Rails to Trails in Clearfield County perfect for cross county skiing. The 73-mile Quehanna Trail is spectacular in winter, as are the trails at Curwensville Lake Recreation Area and the Clearfield to Grampian trail. If you dont have your own skis, Parker Dam State Park has a few pair you can borrow for the day. Nothing beats the thrill of old-fashioned sledding down a hill! Treasure Lake and Parker Dam State Park have designated sled/tubing hills, or ask a local to reveal their favorite spot to race to the bottom? Winter is a perfect time to view plant and wildlife and see colors and habits unique to the season. Its a great opportunity to watch a lone Bald Eagle silently soar in a snow filled sky, to follow the tracks of a rabbit or the coyote chasing him, and see a bull elk without the camouflage of fall foliage. Moshannon State Forest, Wopsononock Natural Area, Curwensville Lake Recreation Area and the Quehanna Wild Area are great places to start your wildlife watching adventure. Watch the CCRTA event calendar for wildlife education classes and hikes. If you can walk, you can snowshoe. Snowshoes allow the outdoorsman to explore winter terrain in places where cross-country skis cant go. Wopsononock Natural Area, the Quehanna Wild Area and Moshannon State Forest are three great places to hike in winter solitude. Snow Shoeing also has the added benefit of a great aerobic workout, keeping your body in shape for spring. If you're are interested in trying out the sport before buying your own shoes, visit Parker Dam State Park and borrow a pair of theirs. Outdoor die-hards do not have to go to Colorado for winter backpacking, you can do it right here? Whether day-hiking or backpacking, winter enthusiasts will find the Back Woods of this part of the Pennsylvania Wilds as exciting and rugged as their more famous counterparts in the west. Be sure to have adequate gear and a "safe plan" in case of extreme weather patterns, and tell someone your travel plans in case of emergency. When its time to come in from the cold; warm up with a tasting tour. Three Groundhog Wine Trail Wineries are close to Clearfield and DuBois, each one unique. Learn about solar processing, old-world traditional methods and test your antique tool I.Q. during a weekend tour. Log on to www.groundhogwinetrail.com to learn more. Award winning artists are present all over the world and Clearfield County is no different. From folk art to digital art our local artisans pride themselves in being world class. The Winkler Galley in Downtown DuBois is a NYC style Studio with a small town attitude. The Kyrie Gallery in Mahaffey combines the warmth of home with the ambiance of fine art, welcoming all who enter the doors. Parker Dam State Park Gift Shop, Clearfield Arts Studio Theatre, the Winkler and Kyrie Gallery and the Strawberry Tree in Curwensville host art from the Pennsylvania Wilds Artisan Trail. So if you are looking to purchase a new piece for your home or as a gift you will be ecstatic with youll find here.